It's da bomb, my favorite! I was sad to learn that when opium was changed to a new box, it 's formula was also changed. The new package size was 3oz and the old formula was in the 3.3oz taller bottle. I was so thrilled to find the 3.3oz old formujla on overstock so I ordered 2 bottles. When I got my order, it was the 3oz bottle new formjula. I was so disappointed. Overstock did accept my return, but what a hassle for them and for me. I keep checking their web page to see if they changed the image and bottle size so you would know what you are ordering, but it remains the same olf formula bottle picture and size. I hope this helps someone from making the same mistake I did. Le's all hope Opium will go back to it's old scent. I have used Opium for about 25 years but since they changed the formula, I don't buy it as much anymore. This is the first bottle I have bought in about 3 years and to say I am disappointed would be putting it mildly. I still have some of the old fragrance, which I use rarely, and even my grandchildren can tell the difference. After this bottle is gone, I am off to the mall to try more new fragrances. Good value! Love this fragrance. Still mt favourite perfume I can afford. Arrival was timely and product in perfect shape. Thank you! Ordered a bottle of perfume 3.3oz received bottle shaped different then picture and only 3oz. I contacted customer service and was told to returm and would be sent correct item..Well guess what, got the same item. It's not the .3oz that I am upset about it's the way it was advertised and the shape of the bottle. Free shipping was slow, but this is exactly what I specified & expected. Product was exactly what I ordered, and arrived well packed, and in good shape. I'm 100% satisfied with this purchase. I love Opium -- and I really love not having to go to a department store to get it. Overstock.com is so convenient and I received my product very quickly. The price is right, too. I know they've changed the formula of this several times, but I still love it and receive so many compliments when wearing it. Love the fact that it takes so little (don't overspray, ladies !!) to make such an impression. Love the smell and longevity . This is my favorite for fall and winter. I bought the men’s for my husband. I was a bit leary buying online versus the mall. But we live over a hour from city. Smells wonderful. I very satisfied. great item I really like it. "Mine is in a tall bottle with a lid, is this a new packaging style of the orginal?" Hi Sharon, The bottle you received is the original formula, not the "new" formula created a few years ago. 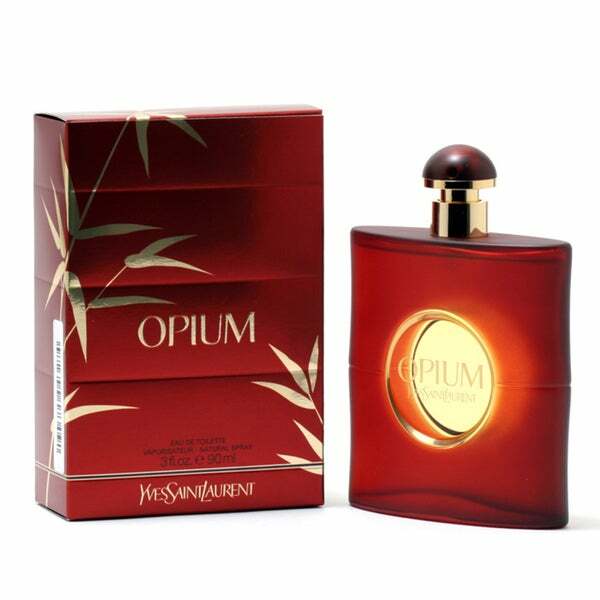 I have been wearing Opium since I was a teenager (when it first came out - I'm 58 now so its been a long time) and was disappointed when they changed the formula, although I still wear it. You got lucky since you have the better fragrance and it looks like its time for me to place an order and hopefully receive the original formula too. I like the comments I get when I wear Opium, delicious. Because I have worn this amazing perfume since 1977 when it originally came out. "Hello! Is this manufactured in France? thank you!" Hello VeniceUS, yes, this is made in France. Thank you for shopping with us! "IS THIS THE ORIGINAL OPIUM ?" Yes, it is. This fragrance was launched by the design house of Yves Saint Laurent in 1977.